The wonderful thing about reading books is that they often lead to the discovery, or re-discovery, of a whole world of other books. 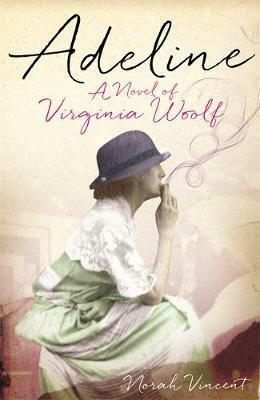 This is certainly the case with Adeline, by Norah Vincent, a lovely, although somewhat melancholy, novel about the life of Virginia Woolf. It’s been a long time since I’ve read any of Woolf’s work and this book made me want to blow the dust off my yellow paged copies and get stuck into them all over again! Based on extensive research, especially Hermione Lee’s definitive biography, Norah Vincent gives us a fictionalised version of Virginia Woolf’s life. Beginning at the time of her writing To The Lighthouse, we follow the events that lead to her final novel, Between the Acts, and to her subsequent suicide by drowning. Adeline was the name given to Virginia at birth, but never used because of the painful association with her mother’s dead sister. Vincent resurrects the name as a way of exploring the inner workings of Woolf’s mind. Confusing at first, it soon becomes clear that Adeline is actually Virginia’s alter ego – an imaginary friend, a muse and tormentor, the voice Virginia turns to, especially when in the grip of one of her bouts of ‘madness’. Virginia and her husband Leonard were at the heart of the Bloomsbury Circle and this novel is littered with references to, and episodes with, many of the great literary figures of the time – T.S. Eliot, James Joyce and E.M. Forster, to name just a few. Anyone with an interest in this group of authors and artists will enjoy this novel. Vincent successfully transports the reader to a world of English country houses where tea is taken in the garden on a summer’s day, and great literary and intellectual discussions take place.